This residence was built in a neighbourhood of single family houses where extremely restrictive design regulations apply. A pitched roof with red tiles, the attic space ridge height, and the roof slopes were all pre-determined. The basic form of the building with its extensions on both sides is a response to its position at one edge of the development, with a view over a landscape of meadows on a flood plain. 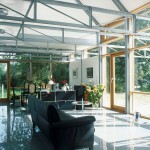 This location allows large areas of glazing without any reduction of privacy. The challenge of this commission was to develop a house using a steel construction system in such a way that, while fitting in with the design guidelines, it would still preserve its individuality through the particular type of construction and the way it connects with the landscape. Prefabrication of the steel construction system made a rapid construction process possible and resulted in an open, permeable quality that can be experienced in all parts of the home: carport, house proper, and terrace pergola.